when the turltes dont know where their nearest library is how had do you think all the silly moms woulda cried about how turtles do not encourage reading? Dude, wtf? Stop making these threads. Our children be learning so muchest gooder things. The scary thing is when you realize the thread creator is 32 years old and he's been posting threads like this for years. I'm surprised libraries even exist still with the internet and everything available digitally. Public libraries are an invaluable resource and should never be done away with. Wow... He deserved every bit of the tongue text lashing he got. I'd hate to live in a world where universities don't have libraries any longer. Everything is not available digitally. And even if something is digital, all of it isn't legally available for free. Libraries may be changing, but they aren't necessarily on the decline either. 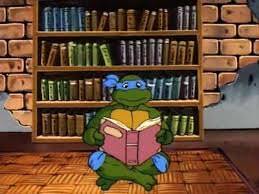 The turtles would've only paid attention to any library if it also sold pizza. The main branch of the Boston Public Library has a 3d Printer/Maker Space available to folks that need one. Not to mention a video game lounge. There are free language learning programs like Rosetta stone you can access online, not to mention all kinds of digital books and audiobooks. Thanks to the BPL I got to hear Terry Pratchett speak. Some people don't have Internet so they use computers from the Libraries. I don't think I've stepped one foot into a library since I was like 10 years old. You said you went to university for 4-5 years. You never ONCE stepped inside your uni's library?! I don't believe he's been in anything other than home schooled. He is way too ignorant of how the world works without resorting to tv stereotypes for examples to think he spent 4-5 years outside his house surrounded by actual people. Of course not. I never stepped one foot into a College library. Why would I?